In a companion article in my Pre-East Series, I offer a quote from Bertrand Russel, the British philosopher and Nobel laureate, I quote his words “firm foundation of unyielding despair.” This was his prescription for finding the “habitation of soul.” The graph lines in the figure below (taken from The New York Times of November 3, 2015) tell a different story. Here’s a big puzzle growing out of that startling new research showing that the death rate among white Americans age 45-54, especially the less-educated, has been rising since 1999. This even though the death rate among all our other age and ethnic groups has been falling. 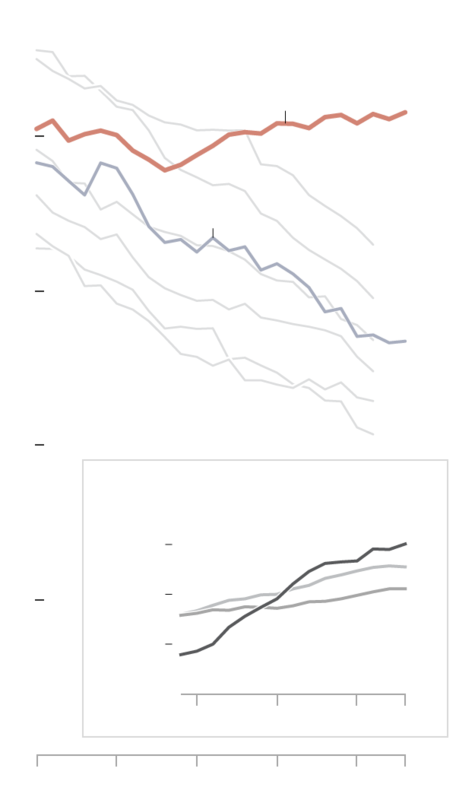 Death rate for U.S. non-Hispanic whites (USW, solid red line), U.S. Hispanics and six comparison countries, aged 45-54. Credit: Proceedings of the National Academy of Sciences. The big puzzle is this: Why does it seem to be happening only in the US? The paper’s authors, Princeton economists Anne Case and Angus Deaton, proposed a couple of possibilities. First, drugs: easy availability in the US of prescription opioids like Oxycontin, plus relatively easy access to heroin, beginning in the 1990s.